Home/Try RailRoute demo 0.5 – Automation Update! 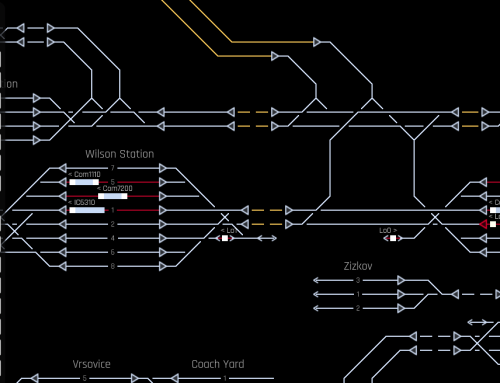 Try newly released demo of Rail Route – a train dispatcher simulator! We call this release the Automation update. Automation allows a player set up his railway network so that works without his hands-on operations. So he can focus on expansion elsewhere. The player can create automation rules that are triggered when certain event happens. Execution of a rule can set switches, lit manual semaphores, create routes from automated semaphores – and even reverse the train. These actions are recorded directly from the main game interface during automation rule set-up. The player just does what he wants to be replayed for each subsequent trains of the same contract. Automation set-up is accessible by clicking Automation in Train Details panel. Station Automation allows triggering the automation when train arrives to the chosen station or when train departs from it. For stopping trains, the former happens when the train actually stops and the latter when it starts moving again. For passing trains, both happens when the train enters the station track (as it is the moment when station visit is logged). Advanced Station Automation allows triggering the automation when some other train arrives to / departs from the chosen station – as it usually means that the common part of the network is already free. Automatic Routing allows triggering the automation when train approaches an automated semaphore. Auto-accept is automation of stations rather than trains – it allows accepting the trains in certain stations without user interaction. The player uses it mainly after all trains entering the stations have been automated and all conflicts resolved. Primary, maybe it is a confusing name because also manual semaphore can be automated, but it is not the same. Secondary, we have seen elsewhere (Brno simulator) that commands to these semaphores are queued and executed once possible (the player can click a semaphore and a subsequent track while it is occupied; the route is created once free). Regarding auto-accpet: maybe it should be a special automation entry on the contract level (beside other automations), not a general setting for the whole station. We spent quite a lot of time developing this update and the release cycle seems to spin down a bit. We will try to release more often. The next things to do are changes in contract mechanics. We will keep you updated! The main pain was indeed the graphics / visual art. Rail Route was born with its schematic view – and we do not want to discard it – but it is difficult to be visually pleasant, mainly because it is not proportional in x versus y axis. We contracted the artists and have seen attempts to put real-world objects into it, but without astonishing success (without any success at all, I would say). So the player keeps seeing just lines there. Another issue was and still is the Save & Load. We believe and hope the player will not face any major failure, but it forced us to re-factor several times to make it work. We found out that Rail Route can be quite a different game after Automation Update. We have had fun automating initial set of trains between Dejvice and Bubny before expanding further. It creates a high-level progress in the game that can be seen from regional perspective – the player has some fully automated regions, a region where automation works are in progress, maybe a region under development (building, accepting contracts) and terra incognita where no rails are laid yet. The good thing is that his growing network does not impose increased operations (inherently). Fully automated regions work as a money machine as well. We have solved nearly all your feedback (and the rest is in the backlog). So, try out newest demo and share your own opinion! Any feedback will be rewarded with warm words. Note: We are providing builds also for Linux and Mac. We did not test these platforms properly. If you encounter some problems, feel free to contact us. My Contract train not disapper from a station. That situation is quiet a tricky and we probably need to clarify it to be more understandable. When you have “spare” trains along the board, random contracts can reuse it. Just accept another contract that start in Bubny station. In meantime, you can purchase another platform and send other trains there. We will address this probably in the next update and we will try to clarify it. There will be also shunting that can be used to move this spare trains away from the platforms.